If you need more space than your computer offers, you can get a portable hard drive. With a portable hard drive, you can plug it into your computer to access the data you’ve stored whenever you need. 1Decide what kind of portable drive you want. Compatible with any computer, portable USB drives live inside their own little cases, and they plug into any available USB port. Some people call portable drives external drives. Like USB drives, portable SATA drives are also portable, living outside your PC. Instead of plugging into a USB port, though, these plug into an external SATA port, a rare feature found on some newer PCs. Because few computers come with an external SATA port, portable USB drives are much more versatile. 2Figure out what features you need (or want) and are willing to pay for. The higher the capacity of an external hard drive, the more information a drive can store, which also raises the price. Access or seek time measures the amount of time the drive takes to locate stored files, measured in milliseconds (ms). DTR (data transfer rate) measures how quickly your computer can transfer the files after it finds them. And your drive stashes recently accessed information in a special, extra-speedy spot called a cache, where it can dish it out quickly if you need it again. 3Before settling on a particular make and model of drive, read that drive’s customer reviews on sites like Amazon and NewEgg. Sometimes it’s a good idea to trade some speed or capacity for reliability. 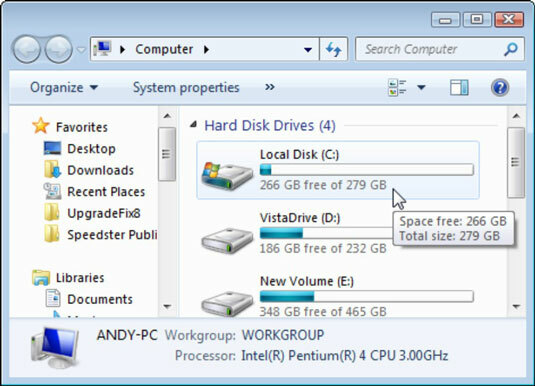 4Find the size of your Windows drive, also referred to as your C partition, by choosing Start→Computer and looking at the number beneath your C drive’s icon. A partition is simply a sectioned-off portion of a hard drive. 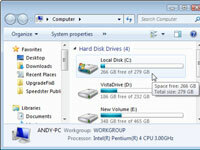 A hard drive can have one partition that fills the entire drive; a drive can also be divided into several separate partitions, each with a different letter. 5Buy a portable hard drive at least as large as your C partition. For example, if your C partition is 279GB, buy a hard drive of at least 300GB, preferably 500GB. 6Plug the portable hard drive into its power adapter, if needed. 7Plug the portable drive’s USB cable into both your computer and the drive itself. 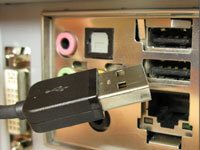 The cable’s large plug fits into your computer’s or laptop’s USB port (left); the small end fits into the drive’s own, smaller USB port (right). 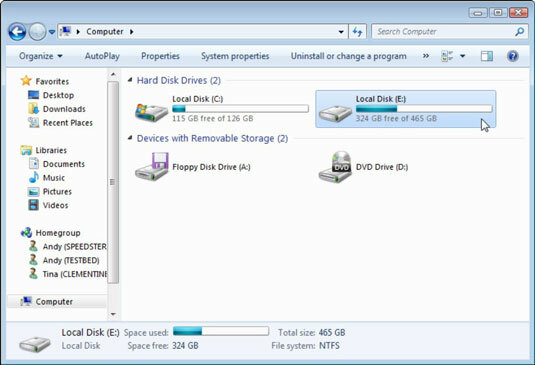 8Double-click the new drive’s icon in Computer to see the drive’s contents. That’s it. After you open its window in Computer, you can start moving files to and fro, just like with any other drive.